alaTest a collecté et analysé 17 avis de consommateurs et d'experts pour le produit Hamilton Beach 42-Cup Coffee Maker - Black/Chrome. La note moyenne du produit est 4.9 sur 5, tandis que les autres produits de même catégorie ont une note moyenne de 4.2 sur 5. De nombreux avis apprécient l'ergonomie. 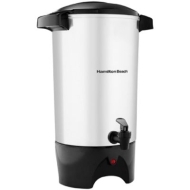 Après analyse des notes de consommateurs et d'experts, de l'âge du produit ainsi que d'autres facteurs, et comparé aux autres produits de même catégorie, le Hamilton Beach 42-Cup Coffee Maker - Black/Chrome obtient un alaScore™ de 83/100 = Très Bien. The best idea ever! Keeps coffee hot and fresh! It looks great in the kitchen goes with jus about any decorations! I would reccomend this to others to use. I love it! The reviewer indicated they are affiliated with this product. Hamilton Beach 42-cup Coffee Maker - a great bargain! Who knew you could get a sleek-looking 42-cup coffee maker for so cheap? This thing is a workhorse and pumps out tons of delicious coffee, enough to take care of my entire office of 50 people. Hamilton Beach is a trusted company that I had to go with. This is an amazingly good coffee maker. My husband was skeptical when I bought this for a party, but now we use it all the time. It is perfect for entertaining or for taking to meetings or any big event, where you want to have hot, fresh coffee. Love it!